As we have been documenting over the last year and beyond, China is rapidly modernizing its military; unveiling a new stealth bomber, an array of guided-weapons, and deploying further from home. 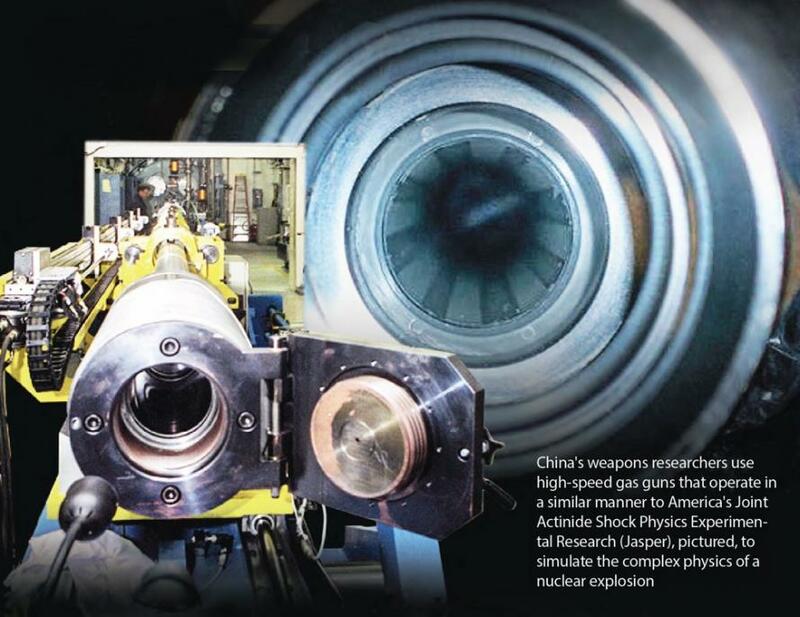 Their most recent focus has been on next generation nuclear weapons - as Beijing ramps up blast experiments for nukes comprised of smaller, smarter warheads designed to limit damage by targeting specific targets, according to the South China Morning Post. China's development of next gen nukes will put them in direct competition with the United States and Russia, sparking concerns by experts over the prospect of a new cold war arms race that has the potential of boiling over into thermonuclear war. Of primary concern is the notion that nations possessing smaller, targeted nukes might be more inclined to use them vs. larger and more devastating munitions - which could easily lead down the slippery slope of larger nuclear exchanges. The gas gun works by using special explosives to force a piston along a hydrogen-filled metal tube. 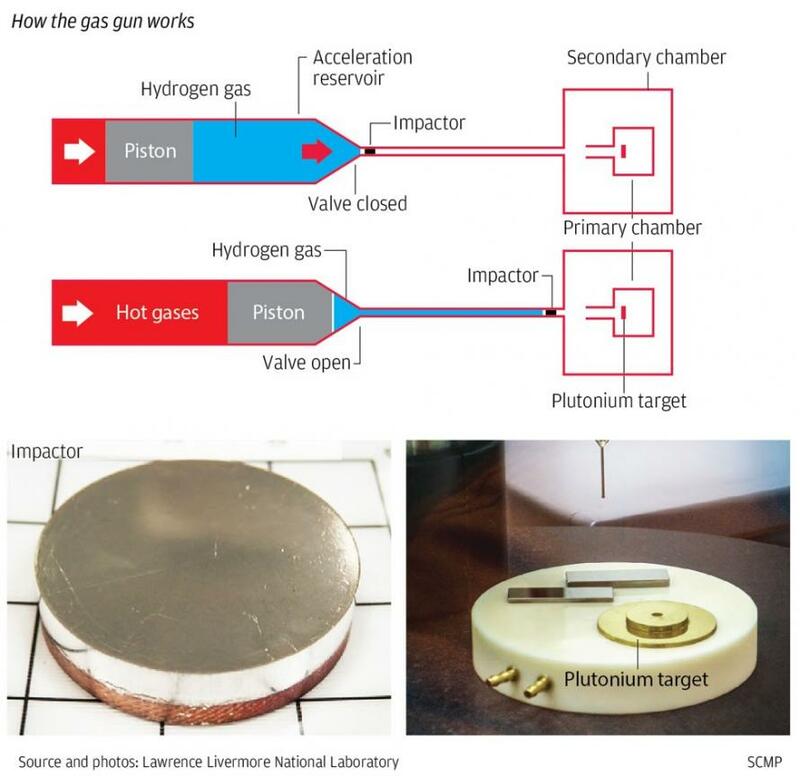 Once the hydrogen gas reaches a certain temperature and pressure, an "impactor" is released which travels at incredibly high speeds of at least 18,640 MPH towards a target. Smaller than a saucer, the impactor is comprised of the same materials used in a nuclear warhead such as plutonium, metal, plastic or foam of different densities - resulting in a chemical reaction similar to that of a nuclear detonation. The impactors are quite difficult to produce, as even the slightest structural defect at the microscopic level of just a few nanometers can ruin the experiment, according to Luo Guoqiang of China's Minyang research center. That said, China can't hold a candle to the United States when it comes to advanced nuclear technology, according to Professor Wang Chuanbin, from the State Key Laboratory of Advanced Technology for Materials Synthesis and Processing at the Wuhan University of Technology. The White House's developments are in response to Russia's recent actions, according to Lewis, who notes that Russian President Vladimir Putin has revealed a series of new nuclear weapon designs - including smaller, tactical nukes - as well as a "super torpedo" capable of wiping out coastal cities. “China is a nation capable of massively increasing the size and improving the technology of its nuclear stockpiles,” stated the newspaper, adding "China needs a new policy to deal with a new situation." And as we mentioned last week, Bank of America's Mike Hartnett writes that the "trade war" of 2018 should be recognized for what it really is: the first stage of a new arms race between the US & China to reach national superiority in technology over the longer-term via Quantum Computing, Artificial Intelligence, Hypersonic Warplanes, Electronic Vehicles, Robotics, and Cyber-Security. 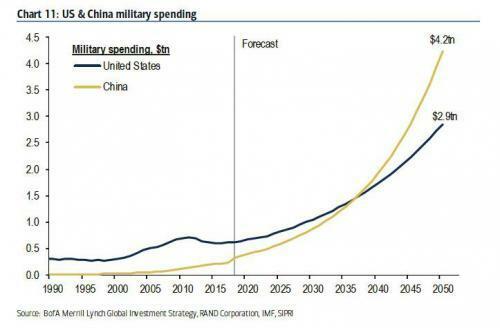 This means that some time around 2038, roughly two decades from now, China will surpass the US in military spending, and become the world's dominant superpower not only in population and economic growth - China is set to overtake the US economy by no later than 2032 - but in military strength and global influence as well. And, as Thucydides Trap clearly lays out, that kind of unprecedented superpower transition - one in which the world's reserve currency moves from state A to state B - always takes place in the context of a war. Which explains BofA's long-term strategic recommendation: "We believe investors should thus own global defense, tech & cybersecurity stocks, particularly companies seen as “national security champions” over the next 10-years."